On Tuesday, November 7th, New Yorkers have an opportunity to vote on Ballot Proposition 1: whether the State will hold a constitutional convention in 2019. Many of my colleagues in the Adirondack environmental world are urging a “No” vote. Anticipating that such a convention would be heavily influenced by moneyed special interests, they are concerned with possible threats to the legendary “Forever Wild” constitutional amendment that protects the Adirondack and Catskill Forest Preserves. They reason correctly that Forever Wild, being the gold standard in wilderness protection, cannot be improved, only weakened, and they don’t want to see State take that risk. I share my friends’ concern about Forever Wild and I agree with their basic argument, but I do not join them in urging a “No” vote. My political DNA is too deeply imbued with grassroots, democratic activism for me to oppose this opportunity for the people of New York to directly act on the condition of their government. I also recognize that simply convening a constitutional convention does not expose the welfare to the Adirondack Park to unfettered abuse by special interests who would exploit it. No matter the goings on among the delegates to the convention, the people of New York will have the final say in the process, by virtue of their vote on any amendments in November of 2019. But count me as wary. If a constitutional convention is authorized, we need to watch very carefully what transpires and be ready to vote down any attempt to weaken the protections that safeguard the Adirondacks. Reading the tea leaves, I’m not anticipating such an eventuality. But I recognize the primary threat to the Park during a convention: indiscriminate corporate power backed by money. In fact, one of the reasons I will vote “Yes” for a constitutional convention is because I know that threat is already upon us: corporate power is already damaging the integrity of Forever Wild. As a long-time activist, I know that the will of the people, expressed as directly as possible, is the best antidote to this kind of power. That’s what can happen in a constitutional convention process. By way of explanation, here’s a scenario. Suppose a corporate interest promoted some deleterious amendment that would, say, open the Forest preserve to mining. Imagine the forces that would array against such a proposal. The opportunity to focus on that action as part of a larger convention process, to educate and engage the citizens of New York in fully embracing and protecting a jewel and asset that almost all appreciate but not all fully understand, would almost certainly outweigh the risks. It would have benefits that would persist long after the ballot smack-down that would almost surely transpire. I’m up for that risk-benefit ratio. So what do I mean when I say that indiscriminate corporate power is already damaging the Park? I’m sure that just sounds like rhetoric to some. You be the judge. Let’s take two of the biggest controversies in the last few years, for starters. I support a recreational trail on the rail corridor between Tupper Lake and Lake Placid. But not for a moment do I think the supporters and volunteers who have operated and maintained the Adirondack Scenic Railroad know and love the Adirondacks less than I do. One of the principal developers and many of the key supporters of the Adirondack Club and Resort live in Tupper Lake. I’m not a fan of that project, but there’s not a chance I think that those folks care less about the importance and beauty of this place, and the people who live here, than I do. Iowa Pacific, on the other hand, doesn’t give one damn. Neither does Imerys, the massive multinational corporation of which NYCO is a subsidiary. 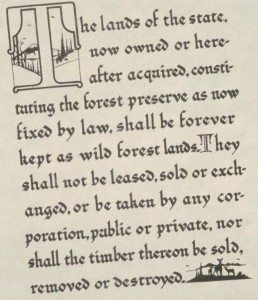 Remember that no constitutional convention was required for interests allied with NYCO to subvert Forever Wild three years ago with a Faustian amendment that authorized the damaging and potential subtraction of two hundred acres of Forever Wild land in the name of corporate profits. The supposed rationale was a beneficial land swap, nonsense on its face, but a way to sell the amendment to an uninformed public. The real rationale was preserving local jobs – that’s what got this thing through the legislature. But this presupposed that NYCO’s parent cared one whit about local jobs. Of course they didn’t. They don’t now: Imerys is massive, and the fate of local workers in a relatively insignificant mine is of little importance. Having lots of experience with major-league corporate power and its single-minded pursuit of return on investment, I wrote at the time about the fiction that the NYCO amendment was about local jobs. I urged us to maintain a regional memory about it, and I had in mind things like the dangers of a constitutional convention. We’re three years out from that amendment, with virtually no activity: how’s it looking now? Meanwhile Iowa Pacific is loading up its tracks up towards Tahawus with unused rail cars, in defiance not only of the spirit of Forever Wild, but local and State Government and the communities through which the rail line passes. This massive corporation even had the audacity to demand seven figures from these communities in exchange for not besmirching the region with miles of tank cars. If these aren’t examples of indiscriminate corporate power damaging the integrity of Forever Wild then I’m the Pope. This kind of power practically begs for a direct dialogue between these interests and the people of the State, who can exercise ultimate authority. That brings up another good reason to support a “Yes” vote on the constitutional convention. I fear that a negative association with Proposition 1 will bleed over to a “No” vote on Proposition 3, the Forest Preserve Land Bank Amendment. That amendment, which has universal support in the Park, needs to pass. I would hate to see it imperiled. In my ideal world, a constitutional convention would lead to passage of the instrument of citizen action that New York State really needs, which is the right of citizens to create their own ballot initiatives through petition. I agree that a constitutional convention opens too big a box; a citizen’s ballot initiative process would be far better. Sadly, such a development is a political non-starter at this time. But if there is a convention perhaps we can achieve reforms to curb government corruption, and address the many byzantine governmental processes that are in dire need of modernization. If, during these activities, Forever Wild is directly threatened, I have great faith in the outcome. So long, at least, as we are wary and vigilant of corporate powers that would seize the opportunity for gain in their interests, and not the interests of New Yorkers. Photo: Article 14, Section 1 New York State Constitution Forever Wild clause. 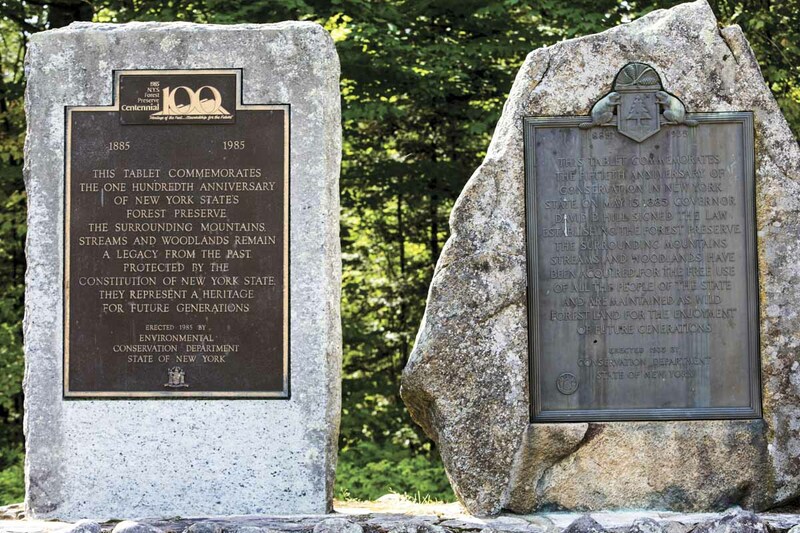 The ongoing attacks by oil and railroad magnates to use the ADK Park as a dumping ground for their obsolete Bakken crude oil ‘bomb train’ tankers should be a clarion call about the high stakes value corporations place on the ADK Park (and all designated US park land for that matter). When corporations propose to change our NY constitution be afraid, be very afraid, of their greedy agenda. I respectfully disagree with Pete Nelson’s optimism that a Constitutional Convention will eventually benefit the People of NY in some ways. 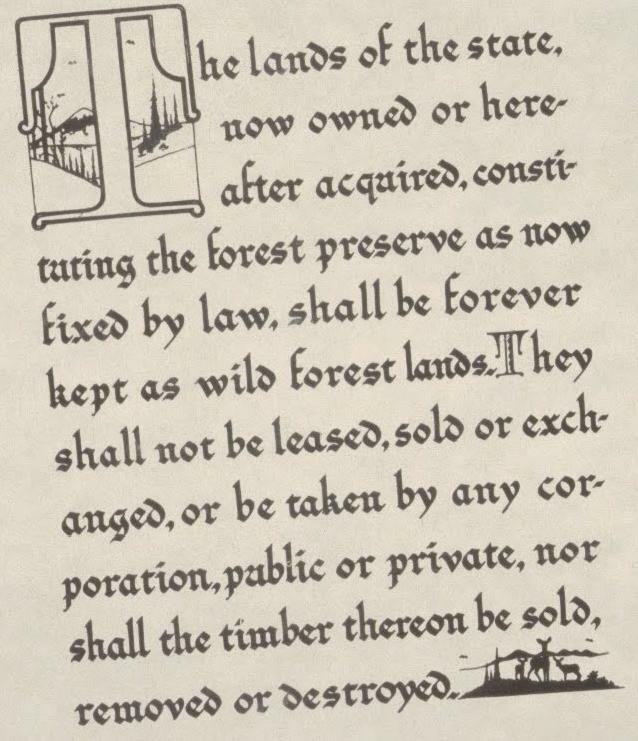 Our NY Constitution’s Article 14 already guarantees the protection of ADK Park’s ‘forever forest land’, uhmm FOREVER. No Constitutional Convention can improve on that. Therefore I will vote NO to a proposed constitutional convention in 2019 that would risk weakening this constitutional protection. I have seen the argument that our state government is horribly corrupt and that rewriting the Constitution is necessary to end the corruption. In response, I ask, “just who do you think will be doing the re-writing?” The answer, of course, is that it will be re-written by the same politicians who are currently running our corrupt state government. I don’t see any proposals to have it done by disinterested third parties. You should incorporate Citizen Initiative Review, which started in Oregon and has spread to Colorado and Arizona. This has citizen “juries” hold hearings, hear expert testimony and issue reports to help inform voters. And, have your Secretary of State allow signing petitions ONLINE, just like registration or changing your address. This would allow groups without huge funds to get their initiatives on the ballot, save the SOS the cost of comparing physical signatures, reduce misrepresentation or harassment for signatures, get more people to read more of the petition texts before signing, and save time, gas, paper and money. The LA Times editorialized for this, and folks have tried to accomplish this by ballot initiative in CA and OR, but failed to make the ballot, illustrating the need for it. Most people thought Trump didn’t stand a chance in the election. That’s the reason I’m voting no on the Constitutional Convention: you just never know these days. My heart broke when I read Pete’s comment about enthusiasm regarding grass roots democracy. I thought “have I become so bitter and pessimistic that I can’t feel that too?” While the answer is “I hope not”, searching my memory for recent governmental, social, political, or national events that inspired such a belief ended in sad frustration. I guess I no longer feel that I can do much good on a large scale and I am losing the sense that I can prevent evil. I am afraid that voting No is about the best I can do these days. This will most likely end with a NO. As usual it is also about political spending. Perhaps the “corporations” would like to see a yes but they haven’t spent anything really to convince folks they should vote that way. As I understand it the NO campaign has far outspent the YES side. Pete, I don’t want to beat a dead horse but I disagree with you on the NYCO thing. There was a large contingent of environmentalists that were supporting that land swap. I don’t see someone like Carl Heilman II (who made a video supporting the swap) as a tool of “Indiscriminate corporate power”. I don’t think the swap example fits here. I feel the NYCO swap is a perfect example of how different parties – including NYS agencies – can spin an issue. I don’t have a strong opinion whether that decision was right or wrong, but what concerns me are potential spins and distortions brought up by a CC that could have much more impact. I am still undecided. Currently I don’t really see the upside of opening this up, so I suspect I will vote no. You might be able to address some ethics issues but I think that they can (with some political will) be done more easily and quickly through normal legislation. They are working on a few now. Getting rid of pensions for crooks as one example. I am not too concerned with any changes to Article 14 making it through this arduous process. As someone who sees both sides of this issue, and listens to all those who love the Park, I’m very conflicted. Yes, No, Yes, No….. I wish I felt as positive about citizen involvement and action as you. It is worth remembering that Art 14 was created by a constitutional convention. I don’t think there is any chance it will be removed and, even if it did propose ending Art 14, I don’t think there is any chance voters would approve it. I do think the only way to address corruption is a con con. So I will vote for it. So, what changes could be made in a convention that would address corruption that cannot be made through amendment? And since the convention is likely to consist of most of the same people currently running politics, why do you think that they would make those changes and not the changes that have many voters nervous? Well I do not believe the NYS Senate and Assembly will ever address corruption on their own. Leaders of both chambers were convicted of corruption, now overturned, and still no cha goes ever came up. We get to vote for reps to a convention. We get to vote on any changes they propose. It isn’t perfect but at least it is an alternative to expecting Albany to do it on their own. Yes we get to vote for the members of the convention. The candates for those seats will be chosen by the same party structures that choose who gets on the ballot for the legislature and senate. Constitutions do not just codify fundamental principles and rights, they also protect us from the dangers of a mob looking to make sweeping changes based on the political frenzy of the day. Sure, sometimes this system of government throttles progress more than our patience likes, it can be slow and frustrating, but this is by design, and it is far, far more desirable to the alternative. One need only look at what this recent wave of populist fever has produced in our country and abroad to realize that throwing open the gates to re-writing core constitutional principles is not such a good idea. If we want changes to the state constitution, there is a safer, more intentional legislative process in place for achieving those changes. One that works through our elected representatives, through the different branches of our government, and through the system of checks and balances that are so critical to a constitutional republic. This is not an end run around voters. Whatever a convention proposes still has to pass by voters. Your worry about mob rule is unfounded. You misunderstood my comment. The voters ARE the mob. I’m not concerned about an end run around them – I’m concerned about an end run around our constitutional system of government. That system is very specifically designed to create layers of representation and checks and balances that we work through to accomplish changes. It is meant to blunt the impact of voters swept up in the latest political fad… it prioritizes long term stability over expediency. It is why we elect representatives to act on our behalf instead of just having ballot measures for everything. It is why there are multiple branches that check and balance one another. It is why the legislative process is a crawl. And it is why we have constitutions that are supposed to be very hard to alter, and only for extreme purposes. That is how a constitutional republic is meant to work. Can you imagine if every 20 years we threw open the doors for the US Constitution to be re-written as soon as 50.1% of the voters got a bug up their backside about it? That would be a horrible idea. This is no different. I’m not familiar with the history of the debate or how NY State ended up with a system where a popular vote can call a convention to re-write the constitution every 20 years, but I can tell you the framers of the US Constitution would have laughed such an idea right out of Philadelphia. Ah, I did misunderstand your comment. But I respectfully disagree and will vote for the con con. I see no other way to resolve corruption in Albany. Still, thanks for the clarification. Dave, like I said I am probably voting NO on this. But this is “re-writing” the constitution. It isn’t expedient. It has many of the checks and balances that we need. Changes have to be voted on by two sequential votes just like if you want to change the constitution the other way. Am I missing something here? I think that is the case. Many progressives would argue that a “good” constitution is not one that is rigid but one that is flexible and can change over time. Yes, and can you imagine a population more sedate than the one we have now in just twenty years? I can. Sedate? Where? We are seeing things upended all around. A huge movement is trying to change the country in ways we have not seen for decades (maybe not in a good direction). Also, all the young people around where I work are far from sedate. I think you and I are living on different planets? I admit that I don’t understand the process of this convention but I just don’t trust Cuomo. After he weaseled in the SAFE act I am leery of his power and influence. You’re not alone on this geogym! He is strange fruit for sure. Which movement you talking about Paul? Some of the biggest movements have failed. Your eyesight is different than mine and yes we are living on different planets. I don’t live in a gated community and even if I did I would imagine many of my neighbors there would be sedate also. I see much good and I know there are tons of good people out there trying to do the right things for the benefit of all and for this planet and future generations….. but I’m a realist too Paul. There’s just too much drowsiness in the megatons of others who simply exist for id or to fit a narrow mold which is unfortunate but what are we to do? We need more people who give a damn about the issues that really matter. But how do we wake them from their slumber? The big question! Sorry Charlie, tonight on my planet I was attending a great screening of a documentary film on genetic engineering in agriculture. It was really interesting and the large crowd was far form drowsy. Everyone “gave a damn” about the issues (and they really matter). There was great dialogue from both sides of the issue from the crowd in a discussion after the screening. They were all awake and luckily not sleeping like on your planet. You should come an join us. While I appreciate your optimism Paul there’s a wider world than the one you inhabit and participate in which is just a microcosm by the way. I suppose you see what you want to see and shut every thing else out which is very common in this society. I still appreciate your optimism though. There you go again with the personal insults. I notice a couple of your favorites are to claim that folks who don’t agree with you are narrow minded or shut out things around them in some way. Ridiculous to say that about me but I understand you know nothing about me. But I see that doesn’t temper your judgment. I’m not personally insulting you Paul you’re reading me wrong it’s just the way I express myself with words on a page it has nothing to do with you and it is true that people see what they want to see and put blinders on to the rest and I was just assuming that maybe you’re that way too maybe i’m wrong I’m not always right. And where did I say that people who don’t agree with me are narrow-minded? I mean sure there is a lot of truism to that as many of those that don’t agree with me are narrow-minded which is the same thing as saying society at large is narrow-minded. It’s always been that way. Why do you think organized religion is so ‘in.’ Why do you think Ellen Degeneres is more popular than say Thoreau? Normally, for any amendment to get on the ballot it has to get thru two votes in both houses of the legislature, each time being with a new legislature. Then voters get to support or reject this. In the case of a con con, the changes that delegates recommend never need approval of the legislature or the governor. The changes go directly to voters. So, geogymn, if you don’t trust Cuomo, this is the way to change something he and the legislature do not wish to change. This is why it is argued a con con is the route to ending corruption. Some good comments here, thank you. To my friends who despair of citizen action in this time for our country, seeing little hope, I would urge you to think otherwise and remember that almost all the benefits of the environmental movement were either partly or mostly the result of citizen action. This includes the Clean Water Act, the Clean Air Act, various other laws and policy changes spinning off from Earth Day and the ecology movement, Right-to-Know ordinances and other action on toxics (which were almost entirely driven by citizen action), acid rain, environmental safety and on and on. Want something recent and Adirondack-related? Our own Adirondack Wilderness Advocates was 100% citizen action. It went from three people and a couple opinion pieces to a leading turnout at public hearings and in written comments on Boreas, with thousands of people from across the State involved (and no pizza, you naysayers). No one directed this: it was grass-roots all the way, and it had an enormous impact on the State’s plans for classifying Boreas. That fight goes on: we’ve generated hundreds more letters to the APA in the past two weeks and turned out in support for Wilderness at their recent hearing. I’ve lived through Vietnam, Watergate and Reagan. Trump is an incompetent demagogue who lies reflexively, but I’ve seen our country worse. In my mind, this is not the time to despair. One commenter feared populism; to that I say it depends upon what kind of populism we’re talking about. Angry white males are not the sole arbiter of modern populism. To those worry about the political machinations at a potential constitutional convention bought by money and stacked with “friends and family” delegates, I concede the concern. A friend of mine pointed out something important to me in this respect. Forever Wild is an uncompromising protection, thus any compromise could weaken it – this is clearly understood. But I did not give enough attention to the fact that political maneuvering could leverage that reality. For example, an amendment guaranteeing a right to clean air could be bundled with a change to Article XIV opening Wilderness to damaging recreation. It would be difficult to separate those things; consequently, people voting for what felt like an environmental advance overall could also weaken Forever Wild with the same vote. That is troubling and it gives me pause, especially because I know from experience that grass-roots activism almost never results in a pure win, but almost always moves the needle in the right direction through compromise. Here there is precious little room to move the needle the right direction versus the wrong direction. My friend’s point is a good one (indeed, as I wrote in the column, I see Forever Wild already under assault from those kinds of dealings). However, when I contemplate New York’s history of support for the Adirondacks, the region’s increasing popularity and the magnitude of the forces that would array against any compromise to Forever Wild, complete with the benefits of a deeper education to down-state residents that such opposition would entail, I have a hard time seeing a danger to the Forest Preserve passing when amendments go before the voters in November 2019. Surveys show public support for protected wilderness remains strong, bolstered by recent Federal developments and the growing effects of climate change. I doubt politicians with much to lose would test that calculus, considering everything else at stake if a convention were held. Finally, people rightly worry about money in politics. But money doesn’t guarantee a win; in fact lately money has a spotty track record. I don’t like the version of populism that got Trump elected, but I will never underestimate the power of an engaged citizenry. So let’s make sure, convention or not, our citizenry is invested in the importance of Forever Wild. One would think “Forever Wild” would be ironclad, but we are clearly seeing how an administration can push the APA in different directions. The APA currently seems about as directionless as a drunken sailor stumbling down the street. Boreas, Forever Wild includes all the different Forest Preserve classifications and potential legal uses of FP land. The administration does not seem to be straying in any way outside those boundaries. Are they? Drunken sailor stumbling down the street? I have friends, and I know lots of other good local people who work there. There is no reason to throw out these kinds of comments. Well, I disagree. I am not casting aspersions on APA employees, I am saying APA board decisions vary with the amount of politics involved with each decision. But I guess that’s the way NY operates. Nothing surprised me more than the 4 options put forth on the Boreas Ponds classification – still pending. > I see hope Pete. There are lots of wonderful organizations and people trying to do ‘what’s right.’ But I’ll be damned if it’s not becoming more and more of a struggle to ward off the demons who seem to be coming out of the woodwork in droves. And the ignorance! Geez. That said….maybe I am just overly-sensitive and am focusing in the wrong direction but I cannot help but feel a sense of hopelessness just from all that I see. I know what it is! I am not continually surrounded by woods in an uninhabited region i’m living in a concrete jungle. Is why I go to that wonderful Adirondacks haven that we’re all so passionate about…to be transformed. I appreciate your optimism too! ‘I see hope Pete’………….’but I cannot help but feel a sense of hopelessness’. Which is it Charlie. I’m an optimist and I have my doubts too John! Hooray for your support of a thoughtful conversation on how to improve the governance of New York State. I don’t understand the fear some have expressed for an open review of the provisions in the constitution. Like you, I have faith in the process and I think we’d be well-served by an improved state constitution. Roger, just to clear the air about trust, I implicitly trust THE PEOPLE to do the right thing; they got us this far and are responsible for our liberties. But after the last national election I no longer trust unfettered capitalist corporations parading as ‘people’. They are overindulged and spoiled mutants with the power to buy whatever they want, including our hard-earned public parks. I hear you Pete, but on balance, given the present political climate, there are just too many dangers inherent in a Con Con. After much consideration and back and forth, my vote is NO. As for the damn oil cars; aargh!!! If I were governor, they would already be gone! Bob, I am curious, what legal provision would you use as governor to stop the RR from storing cars on their tracks? It appears they are following the regulations, they own the easement to use the tracks what are you going to do? Are you suggesting some sort of illegal action be used? The state set this up, now they are complaining about it. I don’t like it either but if I was governor I am not sure that could do much to stop it either. Saying I could stop it is a bit like saying that I am going to build a wall and Mexico is going to pay for it! Oh Paul! don’t even go there with the wall crap! It’s so not applicable to this situation. Neil Woodworth, the exec director of the Adirondack Mtn. Club and a very astute lawyer makes a very good case for taking LEGAL action to remove the r.r. cars. Based on that and the potential power of action by both the APA and DEC, I bet the gov. could issue an executive order to have the trains removed. Of course there would be all the back and forth and law suits etc, but in the end the goal of ridding the Park of these eyesores would be accomplished. Today, the NY Times came out in support of a NO vote on a “con-con.” That’s good enough for me and should be good enough for those of us who believe that lobbyists for corporate interests, developers, and proponents of unchallenged growth would run rampant through Albany with inducements to undermine the protections in place for the Adirondack Park.